Stocks ended little changed Friday, capping a down week for the market, as investors remain sidelined ahead of next week's Federal Reserve meeting. The Dow Jones industrial average, the S&P 500 and the Nasdaq all fell about 1.5% this week, the biggest percentage decline for the Dow and S&P 500 since the final week of August. Stocks have surged this year, with the S&P up about 25%. But the rally has faltered in December, which is historically a strong month for socks. The recent retreat comes amid speculation that the Fed could begin cutting back, or tapering, its $85-billion-per-month bond-buying program when it wraps up its final policy meeting of the year on Dec. 18. But some strategists say the economy is still too weak for the Fed to start removing its support this year, despite the recent improvement in hiring. "In this environment, the last thing the Fed wants to do is make a hasty decision it will later regret," said Scott Wren, chief equity strategist at Wells Fargo Securities. The latest inflation data could bolster those who say the Fed is unlikely to act this month. Producer prices fell 0.1% in November, according to the Commerce Department. The Fed's target for consumer price inflation is 2%, and some economists say the central bank is more concerned about deflation than the size of its balance sheet. The tepid inflation data suggests the Fed might wait to see if the recent pickup in economic activity has legs "rather than risk tapering prematurely again," said Steven Ricchiuto, chief economist at Mizuho Securities. Meanwhile, the bond market is on track to have its worst year in history. Investors have pulled out $72 billion from bond mutual funds this year through the first week of December, the biggest annual outflow on record. The yield on the 10-year note rose to 2.89% this week, near the highest levels of the year, as investors brace for next week's Fed meeting. Bond yields rise when prices fall, so investors seem to be selling now in anticipation of fewer Fed purchases in the future. On the move: Twitter (TWTR) shares jumped 6%, extending a run this week that has pushed the stock up more are 30%. Some traders on StockTwits say Twitter is currently a favorite among big institutional investors and the rally will continue as long as they keep buying. "$TWTR Not surprised if this hits $60 today. Street likes TWTR and fund managers are staying in," said VSTN. Others said the run-up was due to a so-called short squeeze, which is when investors rush to buy back shares of a company to unwind bets the stock would fall. "$TWTR I believe the shorts are helping this stock to go up more. The more shorts the more it will go up," said PrinceRainier. In any event, the surge does not appear to be driven by any actual news. "$TWTR is this normal move of stock, no news just like that?" asked davliner7. Shares of T-Mobile U.S (TMUS). soared more than 8% in the final few minutes of trading after The Wall Street Journal reported that rival wireless company Sprint (S) may want to bid for it sometime in the first half of next year. Sprint gained nearly 4% on the report and continued to surge in after hours trading. Adobe (ADBE) shares surged after the software company reported sales Thursday that came in ahead of expectations. The stock is up 58% so far this year and at least one trader expects Adobe's business to continue growing. "Anything media/entertainment related in print, web etc is built with $ADBE software these guys are industry leaders," said joelyboyblue. Qualcomm (QCOM) named chief operating officer Steve Mollenkopf as its next CEO, succeeding Dr. Paul Jacobs, who will remain as executive chairman. Mollenkopf's name was recently tossed around as a possible successor to Steve Ballmer at Microsoft (MSFT). Electronic Arts (EA) and GameStop (GME)shares rallied after industry research group NDP said video game hardware sales jumped in November. Sony (SNE) and Microsoft both recently unveiled new game consoles for the holiday season. "Gaming stocks pop... not holding them that long... sell before x mas. $EA, $GME," said Judd_Liliha. Shares of petroleum company Anadarko (APC) were down sharply after a court ruled that it and its Kerr-McGee unit acted improperly in its 2005 spinoff of paint materials company Tronox (TROX). The judge said that the company should pay for environmental cleanup. 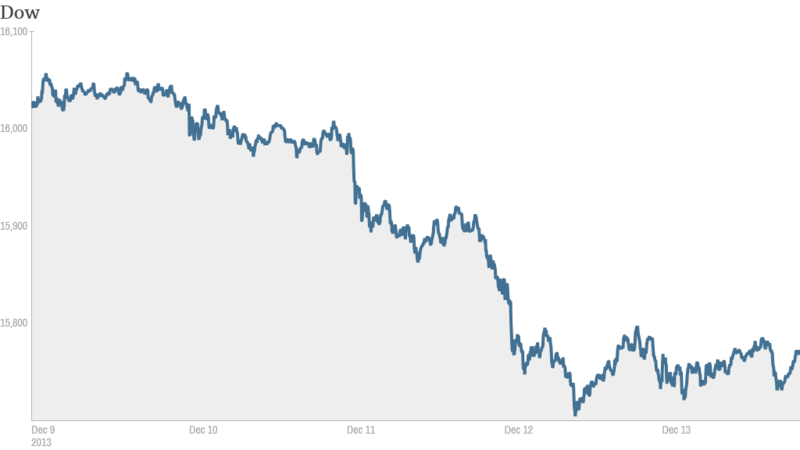 European markets drifted lower. Asian markets ended mixed.